The clothes we wear are mostly made of textile fabrics. The textile fabrics are made of from yarns in weaving and knitting process. Fabrics are converted into wearable garments through the garment manufacturing process in the garment factories. At the time of garment making, functional trims and accessories are attached to the garment at various stages. This article will show you how the garments are made and its processes from fabric to the finished product. Remember, there are different ways of making garments. The most conventional process of making the readymade garments in mass production is explained here. The whole garment manufacturing process, sub-processes and activities involved in each sub-processes cannot be covered in one single article. To help you out to learn it completely I have given links for your further reading on various terms and processes. You can download the PDF version of this article by clicking on the download link shared at the end of this article. As you are reading this article, I am assuming that you are a learner or a would-be garment entrepreneur or you might be planning to start a business in the garment manufacturing industry. I ensure you that you will find a helpful guide once you read this post. Though these are the basic knowledge of the garment manufacturing process, you will get the complete overview of the garment manufacturing. Some of the above processes are parallel process and can be performed simultaneously. 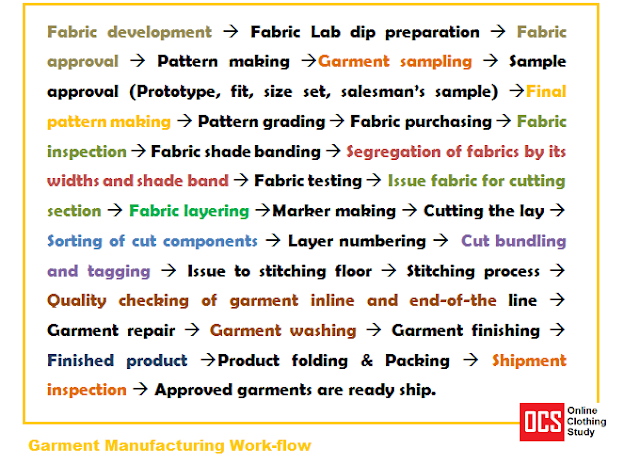 See the Garment manufacturing process flow chart of a typical garment product. This chart would help you understand the process flow in a better way. As a garment maker, garment factories normally purchase fabric from the various fabric suppliers. Prior to sourcing the fabric, there are some pre-production processes handled by the factory merchandiser. Following steps are involved in the pre-production stage. From the design sketch and product specification sheet, garment patterns are made by a technical person (also called as pattern master). To cut the fabric for making any kind of apparel product, you need a template for different body parts. These paper templates are called as a pattern. The first pattern of a design is made at the time of prototype making. The patterns are modified and corrected as the sample development progressed and patterns are graded during size set sample making. The final patterns are approved after the PP sample approval. Now-a-days most of the designers and garment factories use CAD systems for making the patterns. The CAD system has another advantage in maker making, instead of manual marker making marker papers are printed by a plotter. The markers are efficiently made by CAD system and fabric utilization can be improved. Factories develop garment samples and take approvals on the sample from their buyers. Without sample approval, the factory is not allowed starting the bulk process. Factories need to develop various types of samples at various stages of the sample development. Read about different types of garment samples. Garment manufacturers follow the product tech pack to prepare the garment sample as well as the bulk production. In the sampling stage, factory learns the garment construction details and material required for a given order. The sampling department is also work as a research and development (R&D) section for the factory. Sampling process helps production team start the bulk production without many issues. A pre-production meeting is conducted at the factory by the merchandising team. In this meeting product design, production schedule and responsibilities, buyer requirement in all aspect of product quality, and production completion deadline are discussed. Little about Fabrics: Textile fabrics are available in three main categories - knitted, woven and non-woven fabrics. Fabrics are manufactured in textile mills, and power looms sectors. Later, greige fabrics are finished as per the buyer’s (garment manufacturers) requirement. The factory only needs to find the fabric(s) that is required for the style/design. Selection of fabric: There are thousands of fabric designs and fabric quality. Fabric selection is done based on fabric quality required, like fabric color, fibre content, surface texture, hand feel, physical and chemical properties. If the required fabric is already available in the market, factory purchases those fabrics from the stock. For this factory need to explore various places for finding the required fabrics. Otherwise, they work with the fabric supplier to develop the desired fabric quality. Fabric development: The garment maker gives the fabric quality requirement to the fabric supplier for developing a new fabric design. At the fabric development stage, the negotiation of fabric price is done with the fabric vendors. Lab dip and desk loom are developed at this stage prior to bulk fabric order. Prior to bulk sourcing, fabric sample is tested to check whether the desired quality is matched with the developed fabric or not. For yarn dyed stripes knits fabric knit-down is developed. Garment maker takes approval of bulk fabric by sending a fabric swatch to the buyer. Fabric sourcing: How much fabric is required for each garment? What is the average fabric consumption for bulk production? At this stage, there are few calculations on fabric consumption per garment. This work is done by pattern making department (CAD department). Based on the fabric consumption, total fabric requirement is generated for an order and the same is sourced from the pre-approved fabric supplier. The fabrics are in-house in the factory or in a central warehouse of the company. Fabric quality inspection: Whether the fabrics are purchased from the buyer nominated fabric suppliers or from the open market, garment makers are not sure whether all the fabrics are without fault and defect free. So fabric checking is an important process. The fabric may be required to check 100% or can be checked randomly based on fabric quality received. For an example, 4 Point System is used by the factories for fabric inspection and fabric quality grading. Some fabric tests like fabric GSM, fabric shrinkage and color bleeding in washing are done by the factory. If the fabric shrinkage is more than the allowance, fabrics are pre-shrunk for bulk cutting. Sometimes patterns are modified according to the fabric shrinkage which gives the correct measurement in the garment after washing. Fabric sorting and shade banding: It is a common fact that when fabrics are sourced in bulk, the fabrics are processed in different lots (batches) depending on dyeing machine capacity. So, there are chances of having shade variation of fabrics of same colors. To avoid shade variation in garments shade band is prepared by the factory. Sourcing for trims and accessories: Similar to fabric sourcing all required trims and accessories are purchased. Trims and accessories are sourced in advanced to production start. Trims requirement is calculated based on the trims consumption per garment. Quality checking of trims and accessories: Quality of the trims are inspected and approved for production. Trims like laces, twill tapes, button, zippers, and draw cords are tested for color bleeding. Defective and damaged trims are separated and are not used in garments. All the processes and activities are planned and scheduled in advance by the production planner. Production planning team executes and controls the production activities. They keep track of the actual process activities to ensure on-time order completion. A time and action calendar is prepared by planning team for production scheduling and controlling. Mostly the T&A is made by a merchandiser. My book Production Planning and Control in the Apparel Industry would be a very helpful aid in learning production planning areas in the apparel manufacturing. Fabric is the most costly item in garment manufacturing. About 60-70% cost of the garment is incurred in fabrics. For this reason garment makers wisely utilize fabrics. Some of these fabric saving tips in the cutting room surely help garment makers to save fabric as well as money. The bulk cutting is done by means of cutting machines. Different types of fabric cutting machines are available for bulk cutting. Before the cutting of fabric, cut order plan is prepared and the fabric is taken from the fabric store according to the requirement. Following steps are followed in the cutting section. Fabric spreading: First the fabric rolls are opened and spread on a cutting table layer by layer. This process is done by hand or by using an automatic spreading machine. The length of the layer is decided based on the marker size and marker length. Multiple numbers of fabric layers are spread on the table and all the fabric layers are cut together. Depending on the fabric thickness number of plies in a lay is decided. Normally the height of the lay is kept according to the cutting machine blade height. Marker making: For manual marker making, cutter use paper pattern for marking and use chalk to mark outlines of the patterns. 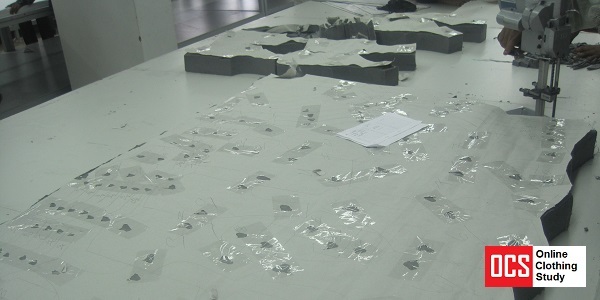 After marking the outlines on the lay, patterns are removed and the cutter follows the outline to cut the garment parts. Component numbering on the marker: Normally in a marker, more than one garment is cut and garment may be of different sizes. To avoid mixing of different garment sizes during bundling and sorting, the size is marked on the top layer after manual marking. For automatic cutting or paper printed marker, this marking is not required, as all patterns are already come with style and size marking. Lay Cutting: After marker making, the lay is cut by using a cutting machine. For a single ply and a small number of plies, hand scissors are used. Ply numbering: Ply numbering is done to all the garment components. This process is included to avoid color variation in the garment components of the same garment. In single piece production system bundle numbering is not required. A hand machine is used for numbering the cut plies. Sorting and Bundling: Cut components are sorted by size, color, and bundle size. Then bundling is done and stored in the cutting room. A ticket (bundle tag) is attached to the bundle to identify the component and style details. Dispatch cuttings to stitching section: Cut bundle are sent to stitching section as per the need of sewing floor and loaded to the line. Some factories prefer to send the whole lay to stitching section and bundling of the layer are done on the production line. Quality checking in cutting section: In the cutting section, quality of the cut components like notches, pattern shape, components measurement, and major fabric defects (hole in the fabric, cut mark etc.) are checked. Parts measurement is taken from the top, middle and bottom plies and compared with the actual patterns, and shapes etc. Read the book Garment Manufacturing Processes, Practices, and Technology to learn and explore the garment manufacturing processes followed by garment manufacturers and exporters. Print copy this book is available and you can place an order the print copy online. Printing and embroidery processes are value added but an optional process. Printing on the garment is done at either fabric stage or after cutting of garment components. For small set up, this is not necessary to set-up facility for printing and embroidery process. If required printing and embroidery processes are outsourced. After cutting and printing process (optional process), cut components are sent to sewing department. Operators stitch and assemble garment components one by one and make the complete garment. At the time of sewing, garments are checked by quality checkers. Stitched garments are dispatched to finishing or washing department if washing is required. The garment stitching process involved following sub-processes. In the sewing section, operators are also provided various sewing supplies like stitching threads, sewing machine needle, trims, operation specific guides and attachments. Parts Preparation: Before assembling the garment, individual garment parts are prepared in the preparatory section. For an example, in shirt manufacturing, shirt collars, sleeve cuffs and sleeves are prepared in the preparatory section and later loaded in the shirt assembling section. The preparatory section is introduced in the line to improve line balancing. Be noted preparatory section is not required for products like t-shirt, boxer, leggings. Marking part: In a garment, some part requires marking to attach one garment component to another precisely. Marking is normally done by using chalk or magic pencil by using a template or laser ray. Like in a formal shirt for button holing and button attachment, front plackets are marked manually to define the correct location of the button positioning. The marking process helps operator deciding where the job needs to be done accurately. Part folding and pressing: Depending on the requirement an operator may need to fold the component and press it by means of a template. Like, chest pocket is folded and pressed prior to attaching the pocket on the chest. Assembly section: The garment components are assembled by the operators step by step in a sequence of product construction. To sew garments different types of sewing machines are used. Quality inspection on the floor: On the sewing floor, stitching quality is checked by the checkers. Normally the semi-stitched garments are checked to detect the stitching faults. The checker suggests a solution to the operator who is responsible for making the defects. Inline quality inspection, roaming inspection, and end-of-line quality checking are done on the sewing floor. Production line set-up: The stitching floor requires a maximum number of manpower in a garment production units including sewing machine operators, helpers, pressman, alteration tailor, feeder, data collection, work-study officer, quality checker and line supervisors. In mass garment production, the production line layout and line setting are done prior to loading every new product (style). The industrial engineers prepare the operations bulletin and line layout. In the operation bulletin, they estimate manpower requirement and machine requirement to produce the target quantity. Learn more about the industrial engineer in the apparel manufacturing from my blog. Production Reporting: Production data capturing and reporting is an integral part of the garment manufacturing. Production and quality related data are collected to track the production and monitoring the production. Various kinds of production reports are made and analyzed by a factory. 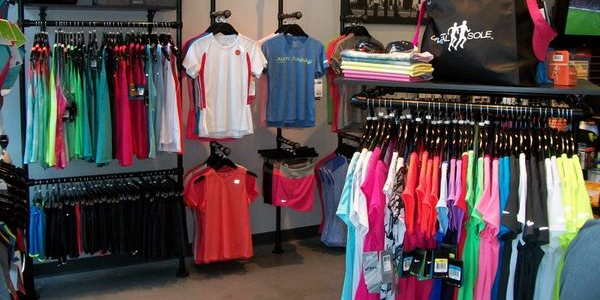 Apparel manufacturers prepare a report on key performance indicators (KPI) of the various production departments. Washing is done to remove dirt and dust from the garments. Washing process involves additional cost, so this process is done only if the buyer asks for washing of their orders. More than just cleaning of garments, washing is also done to give washed look to the finished garment with different types of finishes. All the clothing articles are finished prior to sending to customers. Even a tailoring shop does finishing of tailored shirt and pants. So what activities are normally done at the garment finishing stage? 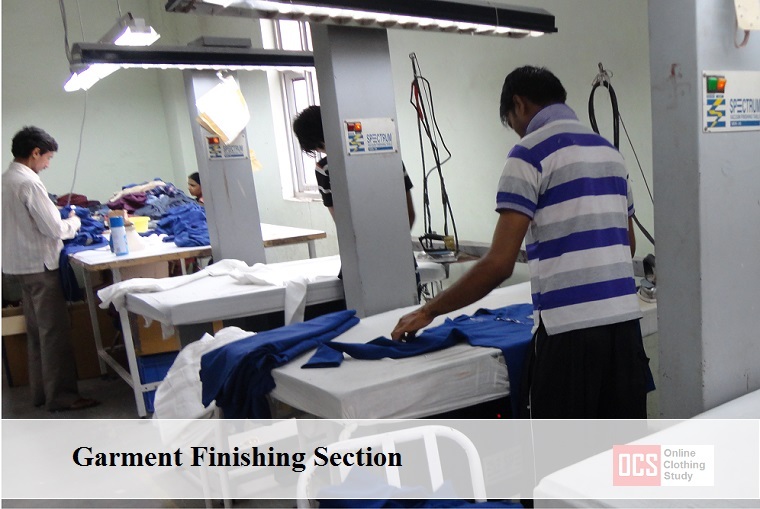 Here is a brief list of garment finishing processes. Thread trimming: In case garments contain uncut threads – left by stitching operator during stitching, threads are cut at this stage. Uncut threads can be trimmed by manual trimmer or a thread trimming machine. Removing the sticker and loose threads: I have mentioned above that in cutting department, all the garment components are labeled by paper stickers. Those stickers are removed manually by a team of workers. Initial garment checking: This checkpoint is placed prior to ironing the garments. Visual inspection and measurement checking are done in the initial checking. Finishing checkers check for loose and uncut threads, ply numbering stickers, garment construction, garment labeling, workmanship and measurement after washing / non-wash.
Checkers also check for stitching defects in seams, fabric defects in the garment and any other kind of defects those need to be repaired. So, at this stage checkers segregate the defective garments and defective garments are sent to the repair section. All stitching defects are sent to a repair tailors. Defect like stains and hard stains, defective garments are given to stain removers. Small jobs like thread trimming and removing of stickers are done by the checker. Garment pressing: The garment pieces are pressed by an iron. Normally steam iron is used for processing cotton garments. In this process, creases and wrinkles in unfinished garments are removed and give a fresh look to the apparel products. Different types of pressing equipment are available for garment pressing. Depending on the product and production volume, the right pressing equipment is used. Final garment checking: The pressed garments are rechecked for measurement and visuals inspection. Shade variation, correct labeling of size and content labels are check in this stage. Any defective garment detected at this stage is sent back for repairing. Folding: The finished garments are then folded in a specific dimension. Folding can be done by using a template too. The price tags, hang hags and any other kind of tags are attached to garment after folding. The garment folding types varied depending on the article and buyers requirement. Sometimes the whole garment is packed in a hanger without folding. Packing: The folded garment is packed into a poly bag to keep it fresh till it reached to the retail showroom. Different types of packing accessories are used to keep the garment in a desired shape. Some products are packed into paperboard cartons directly without packing it into a poly bag. Carton packing: For the transport of the finished garment are packed into bigger cartons. Internal Audit: The packed garments are then inspected for quality assurance of the outgoing finished products. This process is followed for internal quality audit and to ensure that no defective garments are packed into the cartons. Finished and ready product: Finally the garments are ready for the shipment and ready for the end consumers. A garment manufacturing company prepares standard operating procedures (SOPs) depending on the product type and machines they used. It is not necessary to follow all the steps explained above. Manufacturers aim should be producing quality products in the shortest possible time. Remember, all products do not require go through the same process flow. The factory needs to decide what steps they should follow to complete the order. You can read this article offline by downloading the pdf file of this article. Hope you have enjoyed reading thing long article. Share this with your friends and let them learn the garment manufacturing process from fabric to fashion. 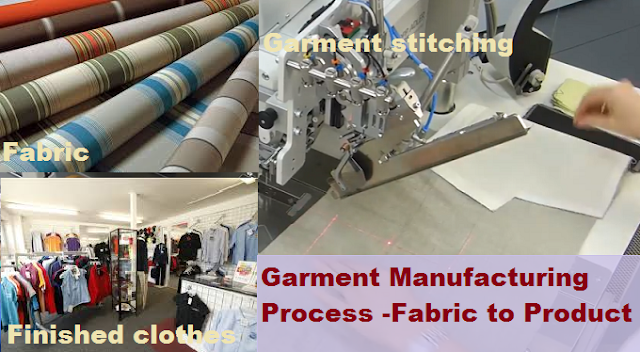 Know the garment manufacturing process from raw material to sampling to cutting to stitching to finishing to final product. The longest post on garment manufacturing topic that gives complete knowledge to an entrepreneur.